Q: Stefano, I have no previous experience but I'm sure the role of team principal at Ferrari is not the easiest job in the world, but it has seemed ‘ apart from the front wing on Fernando's car in Malaysia ‘ a fairly straightforward and happy start to the season for you all at Maranello. Stefano DOMENICALI: Well of course, above all in China it was a great weekend for us. It was a reward for the team and also for Fernando after the difficult race we had in Malaysia. But we have done only three races, so we have done nothing. Our experience and my personal experience tell me that every Sunday could be something different, so we need to keep the feet on the ground and work hard, knowing that things can change significantly, quickly. Therefore, it's important to try to keep this momentum also here in Bahrain; try to maximise the situation of the performance of the car we have now; improve because we are not really at the level we should be, but at least it's important to see that we are starting from a relatively good base to try to keep the development of the car as quick as possible because I'm sure that not only the teams that are represented here but also the others will do a big push already from the first race in Europe. So happy, but very focused. Q: Where do you think that the progress has been made with the competitiveness of your car? Where has the strength has come from? What have you put right over the winter that wasn't necessarily going so right this time last year? Domenicali: Difficult to say for sure. We have done some modifications to our methodology. We have chosen to go towards the Eurozone in one wind tunnel. Without doing a lot of comparison then sometimes in these conditions you may get lost. So I believe that is the main thing. For sure, the speed of the change that you do during the season you cannot see immediately, so it takes time and I'm pleased to see that the improvement is there but, as I said not, enough as I'd like to see. Q: Well, we'll see what happens over the rest of the weekend. Monisha, good afternoon and welcome to the first team principals' press conference you've been involved in this season. 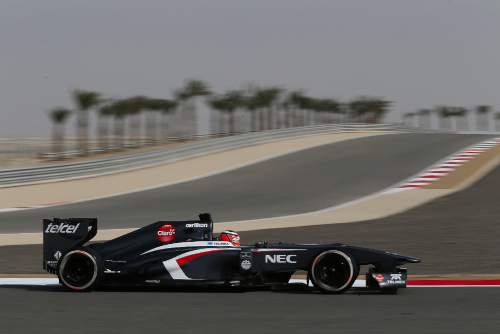 Two new drivers, an all-new driver line-up at Sauber. How would you gauge the progress of the rookie and of the experienced driver you have this year? Monisha KALTENBORN: Well, I think they've really integrated well into the team. With Nico it's less of an issue because he does have more experience now. Of course he has been changing a couple of teams in the last few years, so it's tough for him as well. But as far as I can see he's well integrated. People are happy, he's happy and we're going in the right direction. We can see that with the last steps we introduced in China ‘ because we know we have issues on performance ‘ and we're getting very good from him. On Esteban's side, we have been very convinced, and still are, of his talent, so it's for us now to make sure that he has the surrounding that he can develop that, because clearly neither he nor we can be happy so far with the results that he's shown. Q: It's part of your job, almost, reassuring Esteban that you believe in the talent he has. Kaltenborn: Oh, I don't think I really need to reassure him that much because he's quite confident and he also knows why these mistakes have happened but it's important that you talk a lot to him and you try to support him in getting used to the situation in Formula One and the pressure, because actually drivers like him, rookie drivers, it's quite a dilemma, because they hardly have any opportunity to drive the car, especially in Esteban's case, because he never go any Friday sessions from us. At the same time when he comes in as a race driver the expectations are so high, from the team's side and from his side as well, and there are so few opportunities to actually make points, so it's a difficult situation to handle. Q: And the situation you have in terms of the budget this year: Nico Hulkenberg has been urging the team on to push, you need to develop the car. You have excellent facilities at Hinwil, but do you have the resources you need to use those facilities to their optimum? Kaltenborn: Well, clearly if we had more resources we could do more. We still have room to move on top, but on the other hand we are of course fighting for a resource restriction but the gap actually just gets smaller. No, our situation is pretty clear there: we still have room to move to the top but with whatever we have we're trying to do our best. Q: Martin, no doubt about it, a very difficult opening three races of the season. What progress do you feel the team has made since winter testing, and Australia. Is it enough or are you really pinning your hopes on a major breakthrough when we get to Spain? Martin WHITMARSH: It's never enough, wherever you are in your level of competitiveness, but this year, as you say, we had a very difficult start. We didn't have the performance in the car that we wanted and Australia was a very hard weekend. I think since then‘‚ clearly, there's no testing, it's quite difficult to make some progress and these first four races comes quickly, one after the other. I think we've been, again today, every time the car leaves the garage it's another experiment. We've been gathering data and we've been trying things. I think we've made a little bit of progress ‘ never as much as I'd like or as the drivers or the team would want. I think we're gaining a little bit of performance, we're gaining a little bit of understanding but clearly there's a big push for an upgrade package for Spain and it's important for all of us that we make good progress. But in the meanwhile, we're racers, so those of us in the field we'll take the car and do the best job we can with it, try to maximise the points we can get out of these first four races. Q: It's likely that you'll be even further behind in the Constructors' Championship when we get to Spain. I know that will only be round five and it's very early, but realistically, are you still racing for a Constructors' Championship or is it now just wins? Whitmarsh: I think after three races or even after four races you don't give up in these championships. I think Ferrari did an excellent job last year of showing all of us how you can turn it round and be there right at the end, capable of winning both championships. So, there are always big hills to climb and mountains of challenge but that's why we come motor racing. At the moment we're concentrating on understanding and improving the car. As soon as we make progress we'll be trying to win races and as soon as we win races we'll be thinking about championships. But at the moment clearly we're focused on the here and now and what's the best we can do this weekend. It's a tough circuit for us. This is clearly a rear-limited circuit. It's a circuit where traction is important and that's been a deficiency in our car so far. We came here knowing it was going to be a tough weekend but we'll fight as hard as we can to get what are possible. Q: Paul Hembery, Pirelli made the decision to change the tyre compounds from soft and hard to medium and hard, can you explain why that was? Paul HEMBERY: Yeah, it was done on the Sunday night after the Malaysian race. Malaysia obviously being similar in some respects, from a tyre point of view, to here in some respects: very hot, very abrasive. We felt that both had worked well there and that was the right thing to do coming here. Q: Pirelli were tasked with spicing up the racing. Given the level of opinion on the tyres and the racing this year, do you think the introduction of softer compounds has been an aggressive step just a little bit too far? Hembery: It depends what you're looking at. If you look at it with three different winners in three races, three world champions, then it's been pretty good. Melbourne was probably one of the more exciting Melbournes than we've seen for many a year. We almost have this conversation every year: we've had it the first two years we've been here, and then as we get through the season, the teams ‘ obviously there are very talented engineers in all the teams ‘ and they master the challenges given to them and going beyond certainly mid-season then you'll find these sorts of discussions die away. Q: If you're looking at it from the Saturday afternoon and a lack of action in the early part of the qualifying sessions and then on the Sunday with drivers having to pit after two, three or four laps. Is that what you would have wanted as a tyre supplier? Hembery: Well, pitting two or three laps in is no different than pitting two or three laps from the end, we've seen that as well many, many times as well in the past, so it's just doing it the other way around. It really doesn't change that much. As long as you've got a core product that will give a racing tyre and gives what we were asked to achieve, which is two to three pitstops. I think there was only one time in the past where we felt it went too far, was Turkey I guess in 2011 when we were at four stops. That was too many. I think you'll find the average over this season will be just over two pitstops average so from that point of view, we're happy. In terms of qualifying, last year was probably a good year for qualifying because the cars were very close together in performance. We often saw 16 cars within a second in Q2 ‘ that's maybe pushed out a little bit this year, there's been some strong development from the cars at the front and we're starting to see a little bit of strategy coming into play for Q3 that we saw in 2011. It's early days, one event like that, let's see what happens going through the season. But if it's only on the odd occasion then it's probably not an issue. There are different points of view: some people will say that adds a strategy element to the Q3, and people are generally really interested in who's got pole position and maybe the first three places. Obviously last race we had three ex-world champions in the first three with less than a few tenths between then, so that was good from that point of view. And you could probably say as well a couple of cars starting on a different choice gave us quite an interesting finish with Sebastian coming flying through at the end. And probably if he hadn't had the traffic he might well have even got a better result. So it's a game of opinions. Ultimately we'll do what the sport asks us to do, of course, and if we do feel together that the qualifying's not work I'm sure we'll all find a solution together. Q: Eric, Romain Grosjean has a new chassis for this weekend and for the next few races. What was the thinking behind that? Was there a problem with the old chassis? Was it trying to help his confidence rebuild? Eric BOULLIER: It's a whole thing package. We try to find out. He's not as his best, let's say, where we think he should be. There's nothing to blame, actually to finger-point anything, it's just the addition of different things. So, we decided to go though in details and deep enough to even take into consideration to change the chassis. Q: We have a debate in Formula One, as F1 fans, what's more important: good car or a good driver. At the moment you've got a good car and in Kimi Raikk nen a very good driver ‘ how important is Kimi Raikk nen to the long-term success of the Lotus team? Boullier: I think he's part of the success, or sort of success, that we've had since a couple of years, or let's say at least last year. It's true that Kimi does help the team stepping up but behind Kimi there are a lot of people ‘ and good people ‘ working hard and actually working well. I think as usual it's to get the full package really working all together. Then you can see some results. Q: And you're confident that once again you have the budget to cope with a title battle and a development race off the track as well as on it as well. Q: (Kate Walker) Monisha, we've heard recently in the last week or so talk of Pirelli bringing an extra set of slightly harder tyres for teams running a young driver on Fridays. Given your comments earlier, is this an initiative you support? To give rookies and developing drivers more opportunities on track? Do you think it's a good idea, will it be better for the show, and so on‘‚? Kaltenborn: I think it's a good idea because it gives you first of all a good reason to really get in these drivers. And I think it also should be done in such a way that it should be not just an option. Maybe as a regulatory thing coming in that really you have to this, otherwise not many teams would really make use of this kind of an option. We see it with ourselves: if you have already a rookie driver who is one of your regular race drivers, do you really want to take away time from them to still get another one in? So, I think if it just comes in as an option we really would have to think about it: do we make use of it or not? But on the other hand it's extremely important as we can see with such drivers that, if they have more opportunities they're simply better prepared. It will be a difficult call for us if it's just an option. I'd prefer if actually it went down somewhere in the rules that you have to do this. And apart from all of this is the show element that you mentioned. You are maybe make it more exciting and maybe you could also get more cars to run. If you look at the sessions on a Friday, you have the first half an hour fundamentally, nothing going on. It could have overall a very good impact and also for the tyre supply I guess it would have a lot of positive effect: always getting someone new in, something exciting, new information, new faces coming in. Q: Just to clarify, what would you prefer? Two cars running on the track or a third car being run for a rookie with the extra tyres? Q: Stefano, if I can bring you in on this. Would Ferrari be wanting to run rookie drivers, drivers from your Young Driver Development programme? Domenicali: Just to answer to your question about the tyres: yes, extra set on Friday to be used in the morning. Not only for rookies but for everyone. It would be difficult to explain to the people that are on the grandstand that Mr X has an extra set of tyres to run and Alonso, Hamilton, whoever is not running because that extra set of tyres is just for the rookie. If we have to do something then I believe it is a good idea, to be honest, that we should do it for everyone in order to increase the number of running on Friday morning. Q: Martin, don't run a rookie driver? Whitmarsh: Well, I think similar opinions to Stefano. It was originally discussed that there should be an extra set of tyres for rookie drivers but I think that's quite difficult. At the end of the day, if the people who we're thinking about in the grandstands, I think they come to see Alonso, Hamilton, Raikk nen, Button ‘ that's who they want to see. I think if we all put out rookie drivers they've not heard of, I think they feel cheated in some way. Boullier: I have to say I do share the opinion of my colleagues in the front. An extra set of tyres, yes. We need to just make sure that we could maybe run it for everybody and not only for rookie drivers. Q: (Mike Casey ‘ Associated Press) It caught my attention the other week that Red Bull were talking about possibly breaking the two second mark in pit stops. I just wanted to get your thoughts how pit stops had changed in the last year or two and if they're becoming a much more significant part of the whole race, especially with the tyre issues? Domenicali: I think that it's many many years that pit stops are part of the performance of the team, performance of the team is a performance of the position on the track, it's part of the performance with the strategy and so on. So it is quite natural that you try to develop systems to try to minimise the reaction time of the guys, to be as quick as possible, and I would say this is part of the attraction of Formula One and I think that we are reaching the limit, where to have a pit stop shorter than what we are almost doing is virtually impossible. The driver has to arrive and has to at least engage the gears and the clutch to start again, so it's a physical thing that he has to do. So it's one of the things where Formula One teaches everywhere that there are all sorts of room for improvements everywhere and this is a challenge. I also remember when we had the pit stops with refuelling, it was another stop where there was another part to it and unfortunately I remember very well in 2008 you can make mistakes which can cause problems to the team, but as I said, this is part of the nature of Formula One. I think it's really nice to see that. Boullier: Pit stops are part of racing. In most of racing today you have pit stops. It is clearly important to get this association with the pit crew, having this competition involved into the result as a global performance. Q: Martin, I suppose with the regulations getting ever tighter, pit stops are one area where you can gain tenths of a second. Whitmarsh: You can. They've got quicker and quicker. We used to think four second was stunning. I think at the moment, as far as I know, I think we still have the quickest one at 2.32 seconds. I think it's possible to get below two seconds. I think it's dangerous to put too much focus on that. I think now they are sufficiently short that in fact the odd tenth difference between the stops isn't material What is material is the pressure we put people under to get to about a two second stop. Every now and then it goes wrong, and so the ones that are material are the ones that go wrong because of the pressure we put on people to try and do it in two seconds, and those are the ones that are often the game-changer, not 2.3s versus 2.4s versus 2.6s. I think we've learned that to our cost, we've certainly put a lot of pressure to try and get down there and consistently be the quickest. In recent weeks I've said to the guys I'm happy for it to be a bit slower providing they're absolutely foolproof and I think that's probably the right thing to do. Q: At Sauber, how do you prepare your crew for a pit stop and try to gain extra tenths? Kaltenborn: Well, we've had some good examples like McLaren managing to get under three seconds. We're not quite there I would say. Over the years, you see how quick pit stops have been getting so now this margin for us is trying to be at or under three seconds. I think what's also happened is - which the guys with the pressure are fully aware of - is that even if you get things just a little bit... just a few (tenths), not even a second or so wrong, you have so much more to do than gain positions because the whole field has got together, so I think that's where also a lot of pressure has come from. Even the slightest mistake can lead to quite a lot of position losses in the race. Q: (Dieter Rencken ‘ The Citizen) Last week, I asked the team principles present in China how they felt about the fact that the FIA will apparently no longer get involved in regulating the cost control process. How do the four team principles here feel about that? Whitmarsh: I think Formula One teams are fairly tenacious so I don't think we give up on it. I think we all know that cost control is important in Formula One. There are maybe four teams that have financial stability and certainly we don't feel threatened at the moment as a team, but we're very aware that there are currently eleven teams, we need eleven or ten teams minimum and I think it's very easy to under-estimate the challenges that those teams are facing. It's something that when the emergency happens and teams start to fail, it's too late to react and I think that will go like dominos. Therefore, it we want to be responsible members and citizens of Formula One, then we've got to do what we can to control costs, we've got to do all we can to ensure that a minimum ten but at the moment that eleven teams have got sustainable business models. I think that's a right and sensible thing to do. We've put a lot of effort in. We've had some success. We're pretty good in Formula One at talking about our failures because we've had those as well, but we've had some success. There's some sensible measures out there. We need to do more. We've reached the point where it's natural for a governing body to get involved. We've seen that in other sports. I understand that the FIA needs encouragement from the teams and I'm going to continue to do what I can to encourage the teams to try and work together. We're not natural workers together on these sorts of issues. We work better in crisis situations but I think it would be foolish to wait for the next big crisis in Formula One to try and work together. I think the right thing is to work hard at it now. I'll certainly keep pushing but we will see where we go. Kaltenborn: For us it's absolutely clear that you have to control costs in the near future. You can do that in different ways. You can look at the measures that we have now, like an RRA. You can look at stable regulations, probably a mix of everything which would lead you there and you definitely need to do that to have a healthy sport. Ideally, like Martin said you would want your Federation involved in it and we won't give up on that, and try to maybe talk to the FIA to find ways how we can get the involved. Boullier: I think we need to take into consideration how to control costs. It's a very serious matter now in Formula One. The RRA was one way to do it which I believe was the right way to do it but it looks as if there were different opinions. There are, as Monisha said, several ways to do it, we need to do it properly, having more stable regulations and stricter technical regulations to avoid any loopholes to spend more money. I think this may be the only way to control costs, to have them policed correctly. This is the support I will give. Domenicali: I agree that we should control costs, the matter is how to control them, to be honest, because we tried in a way, we made a great step forward, because I can talk about us, which for sure is one of the top teams which spends that amount of money because other teams honestly will not reach that level. For sure, we need to work together in finding the way to control it. I'm very open whether it has to be the FIA or the teams working together because there are always pros and cons but we should do something together, that's for sure. Q: (Mike Casey ‘ Associated Press) Obviously we're in a country that is going through a political crisis, not at the circuit but outside in some of the neighbourhoods there are some pretty tough clashes between protesters and police. Your thoughts on coming back here again, even with those protests going on? Domenicali: I don't think it would be good for Formula One to be involved in the political situation of the country because then there is the risk of being pulled from one side to the other, which is not really what we should do. For us, it's a place where Formula One has always been hosted at the top level and we see since 2004, when I believe the first Grand Prix was here, that there was a great development of Formula One as a sport in the Middle East area. Other than that, I cannot comment more. Kaltenborn: I fully agree with that. For us, it's first of all the responsibility of our Federation and the commercial rights holder to evaluate the situation and then decide whether we race here or not and if they think it's the right decision then we come and race here. Whitmarsh: I think we're only all qualified to talk about it from a sporting perspective and since Bahrain introduced Formula One to this region, it's been a great event and a hospitable Grand Prix to attend. Really we're racers here, we're here to go motor racing, and I think that's all we should be commenting on. Hembery: There's not really a lot you can add to what's just been said in many ways. It's hard when people try and draw you into a political situation which is something that we're not really qualified to comment on. I really just concur with what's been said. Boullier: Being the last one... I just hide behind my colleagues saying they've said everything. It's true that we don't want to be dragged into a political situation. If the promoter, the FIA and the commercial rights holder agree with the decision to race here we race here. Q: (Dieter Rencken ‘ The Citizen) Paul, shortly before lunch, when asked about the Pirelli situation, Mr Ecclestone said rather cryptically that 'from our side it's all done.' Is that your understanding of it? Could you explain what he could have meant by that please? Hembery: (Laughing) What, you didn't understand that, then? Well, it's all done then from his side. I think that's all I can say. It's on-going, I think I've told you before that we need to have some clarity over what's going on, going forward. As time passes, we have to make decisions as a business. We're not immune to what's going on in the European automotive business in particular; sales were ten percent down in March in the overall market. That impacts heavily on us and we're currently having to make action plans to address those challenges. I would think that from our point of view, sooner rather than later... time is of the essence, I would suggest now. Q: What is the time scale? Hembery: I don't particularly want to give deadlines to everyone because it seems like a negotiating point but there is a time scale and I'm pretty sure I know what it is. You might be inviting me here shortly to have a different type of press conference, I don't know, but there has been progress and we are discussing and hopefully it will get resolved in the near future.